I was somewhat skeptical of Morocco, even as others raved. One of my best friends honeymooned here and fell in love with bustling Marrakech, Essaouira’s boho beach vibes, and the scenic sights of the High Atlas Mountains. The country topped my girlfriend’s travel wishlist and still, I resisted, favoring trips to France, Japan, or Peru. Then I came to Morocco for a wedding. Like me, my cousin Todd grew up in a Jewish family in Montreal. Unlike me, he’s now a practicing Sufi, lives in Fez, and most often goes by Husayn -- and now he was set to marry a Moroccan woman. We grew up spending every winter break together in our grandparents’ house in North Miami Beach. I inherited both his clothes and his love of tennis. I wanted to be at the wedding. My girlfriend considered it a win. I can be stubborn, but sometimes everyone else is right: Morocco is beautiful. All those vibrant tile mosaics adorning centuries-old mosques, renovated riads, and public fountains are as advertised. Ditto the desert oasis palm groves that produce the most tender and delicious dates. The snow-capped mountains, the craggy canyons, and especially the surreal red sands of the Sahara are true wonders of nature. 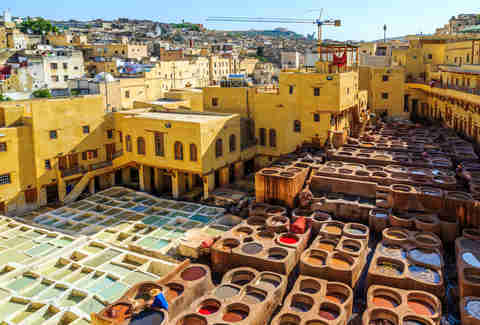 And even if you’re not invited to a wedding, Fez is worth visiting for historical and religious sites, exemplary traditional cooking (from spicy flatbread to rich and complex lamb tajine in restaurants), classic pottery, and fine leather goods straight from the tannery. The wedding itself started slow; we waited over an hour past the designated start time for the bride’s arrival. But when she came, she made quite the entrance, hoisted on the shoulders of four men atop a gilded platform, wearing a matching embroidered gold dress. After she was paraded around the room, we hungrily feasted on crispy seafood bastilla and smoky, spit-roasted lamb méchoui, digesting as the bride changed into another bright green dress and had henna applied on a sofa set center-stage. My concerns about the trip began to fade -- Morocco had my attention. I began to look forward to exploring more of Fez and to our tour through the middle of the country with Sahara Desert Crew -- one of many companies that offer similar services -- with stops in the desert, the gorges, and the mountains that local wedding guests kept suggesting we visit. Still, I couldn’t help but wonder whether Marrakech was as animated as advertised. But just as my skeptical side began to reassert itself, the bride changed once again. This time, both bride and groom had their own platforms, but her outfit was the true star. Wearing a traditional -- and enormous -- gold and beige Fassi headdress, she sat with her legs tucked under cover of gold fabric tucked into her temporary throne. And as she spun around the room looking part princess, part pyramid, dancing in mid-air with my cousin as they both sat on their platforms, I knew Morocco would continue to surprise and delight. Google Maps has nothing on Fez. On my first night wandering the ancient medina of this northern Moroccan city, I followed the same GPS-suggested loop past stalls hawking argan oil and cashmere scarves for at least half an hour in my quest to get to dinner. But getting lost in the maze of small laneways is the best way to experience the city. You might be looking for the famous Chouara Tannery, where cow, sheep, goat, and camel hides are softened in a pungent mixture (which includes cow urine and pigeon feces) before they are dyed in strikingly colorful, open-air vats filled with natural pigments like indigo, saffron, and poppy. But along the way there are other secrets to discover. Take, for example, the local honey souk, where honey from across the country are tasted out of blue plastic barrels -- think Walter White’s lab on Breaking Bad -- including a rare variety from a mountain cactus-like plant called euphorbia, which boasts an intriguingly spicy finish. 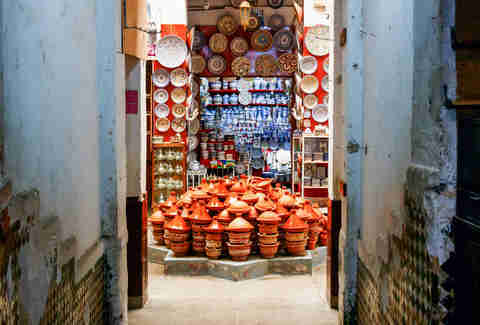 A quick jaunt from the labyrinthine streets of the ancient Fez medina, the Ain Nokbi neighborhood is home to most of the city’s potters and tile workers. At Art Naji, I enjoyed a free guided tour where artisans craft tagines and tile mosaics by hand in front of walls emblazoned with #ARTNAJI stickers before visiting the somewhat overpriced, but well-stocked onsite shop. It sounds silly, but it’s a good start before checking out less touristy shops on your quest for the perfect take-home tagine, like the Cooperative Artisanale Des Patrons Potiers de Fes, just around the corner. 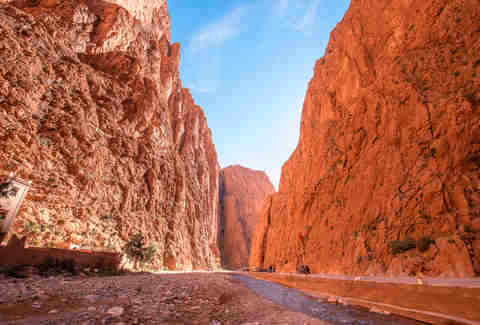 After purchasing a rug at a Berber cooperative in the nearby city of Tinghir, our guide brought us to the foot of this narrow canyon surrounded on both sides by red rock walls rising 500 feet straight into the sky. Nomad families pack their donkeys with freshly-filled jugs of water from the light stream that trickles on the canyon floor, as rock climbers hang precariously above-head from the sheer vertical walls. Come for a climb, a hike, or even just a moment to relax and reflect, especially in the early morning as the sun fills the cracks between the stones and there are no tourist buses yet in sight. 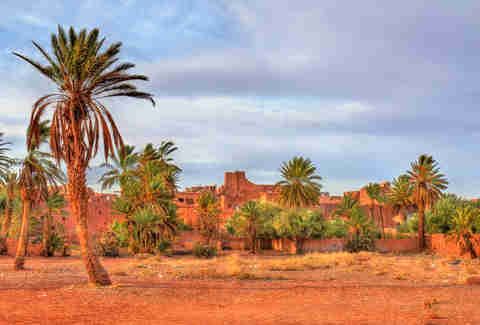 Surrounded by barren sandy soil and mudbrick kasbahs, the bright green palm trees of the Skoura palmeraie (“palm grove”) and surrounding garden plots seem to sprout up out of nowhere. I can’t even keep a houseplant alive, but somehow the ingenious ancient system of canals here keeps this UNESCO-protected palm grove alive with date-filled trees and fresh produce in the middle of a desert. Bird-watchers abound here, as countless species flock to this flourishing oasis. 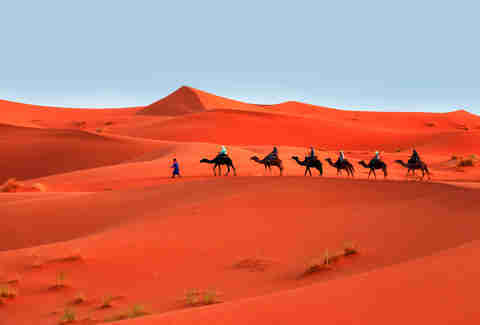 A sunset camel ride into the deep desert dunes of the Sahara is an unquestionable highlight when visiting Morocco. Surrounded by surreal soft slopes of red-tinged sand, I felt inconsequential. It’s enough to make anyone a dimestore philosopher--and so picturesque that it also makes anyone with so much as a smartphone seem like a National Geographic photographer. 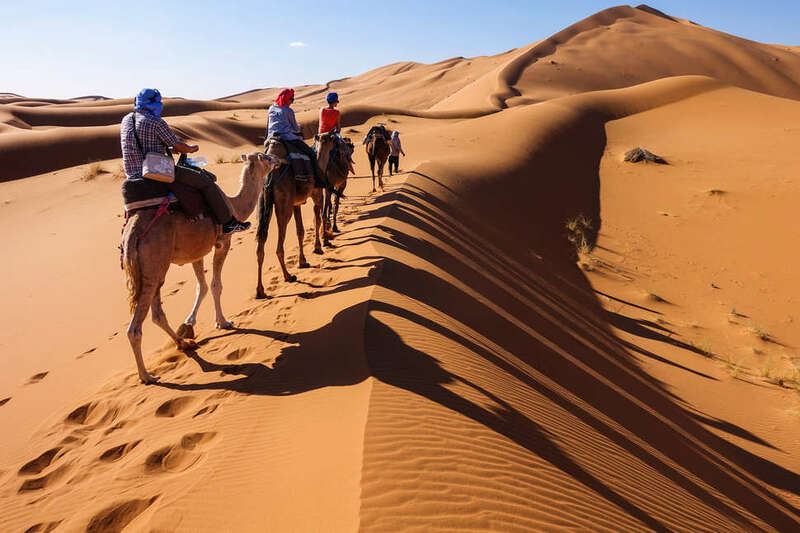 For the best experience, spend the night at a Berber camp in the dunes staring up at the star-filled sky and venture back on your dromedary at sunrise the next morning. Just prepare to find red sand in your laundry for weeks after your return home. You may know it as Yunkai, one of the slaving cities that Daenerys Targaryen -- aka Breaker of Chains aka Mother of Dragons, et al. 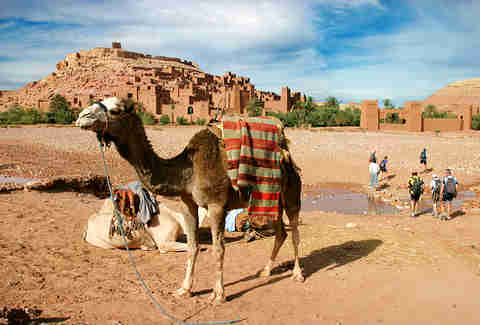 -- lays siege to on Game of Thrones, but this fortified village’s real name is Ait Benhaddou. If you’re a GoT superfan or movie buff -- films like Gladiator, Lawrence of Arabia, and Jewel of the Nile also shot here -- this mudbrick ksar (earthen buildings) with spanning views of the surrounding valley is a fun visit. If you’re not so enthused by pop culture, a walk through the winding paths of the village up to the crumbling ancient fort at the top of this UNESCO Heritage site is still a great way to explore traditional southern Moroccan architecture and stretch your legs on the route to or from the desert. A trip up and down the tight, winding roads of the Tizi n’Tichka mountain pass is the most common way to get to and from the Sahara from Marrakech, but the High Atlas is a worthy destination in its own right. The snow-capped peaks of North Africa’s highest mountain range (with elevations up to 13,671 ft) are beautiful, and fit for skiing in the winter or climbing and trekking at other times of the year. 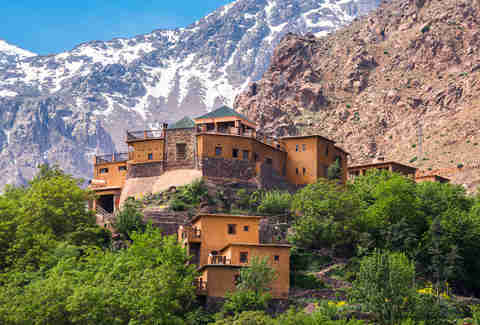 Richard Branson’s luxury mountain resort, Kasbah Tamadot, makes a particularly lovely -- if absurdly expensive -- retreat from the madness of Marrakech. The country’s prized argan oil is also produced here, so be sure to buy some at the source. Morocco is a Muslim country, but it produces a surprising amount of wine -- about 4.5 million cases annually, almost all of which is consumed domestically. Domaine du Val D’Argan, located just outside the hip coastal city of Essaouira, is one of the country’s most celebrated producers. 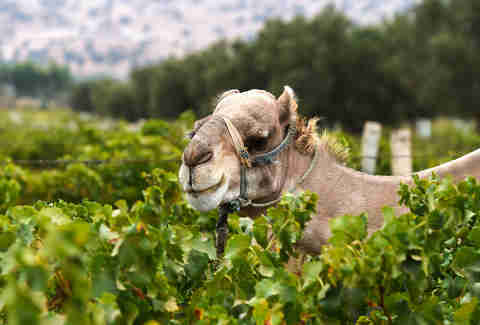 Meeting Goliath, the camel that helps plow the organic vineyards, should be reason enough to visit, but the wine is also quite good (Rhone varieties like syrah, grenache, mourvedre and viognier fare especially well here), and the onsite restaurant is a beautiful setting for a leisurely lunch. Merely driving into the Marrakech medina nearly reduced our young guide to tears. Motorcycles fly by with little care, shopkeepers loudly hawk their wares, and local touts offer conflicting directions. It’s a lot, apparently even for some Moroccans. Luckily, there are places to escape the hectic medina madness. An obvious and worthwhile option is the famed Jardin Majorelle, purchased by fashion designer Yves Saint Laurent and gifted to the city, but Parc Lalla Hasna is my choice for real relaxation. 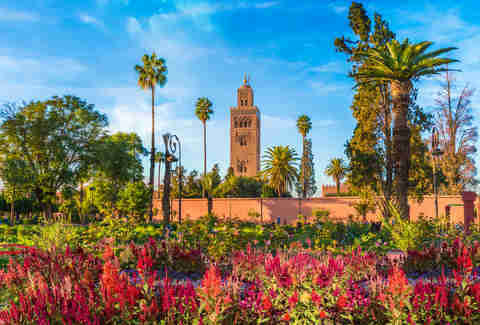 Blooming flowers and trees brimming with oranges, lemons, bergamots, and dates fill these gardens located just behind the Koutoubia mosque, making the park a perfect place to take a stroll or sit with a fresh pomegranate juice as you take in the call to prayer. Pro tip: this park is also located near both La Mamounia and the Royal Mansour, two high-end hotels well-worth visiting for high tea or a drink in the lap of luxury. Marrakech is known for an overload of energy and bright colors, but the explosion of colorful pop art behind the nondescript doors of Riad Yima in a narrow alleyway off the medina’s spice market takes it to 11. 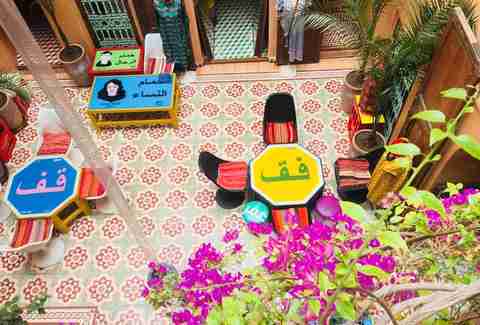 Hassan Hajjaj -- dubbed the “Andy Warhol of Morocco” -- transformed this old home into a gallery, boutique, and tearoom that offers a peek inside his brilliant, bustling mind. Hajjaj built furniture from recycled advertising signs and bright red plastic soda crates, plastered the walls with his signature cheeky photos of Arab life, and made a rooftop gym out of recycled paint cans that sub for barbells. The second floor of the riad also hosts rotating exhibits of other contemporary artists, making this a must-visit for art lovers. Charlie Friedmann is a Toronto-based food, drinks, and travel writer.